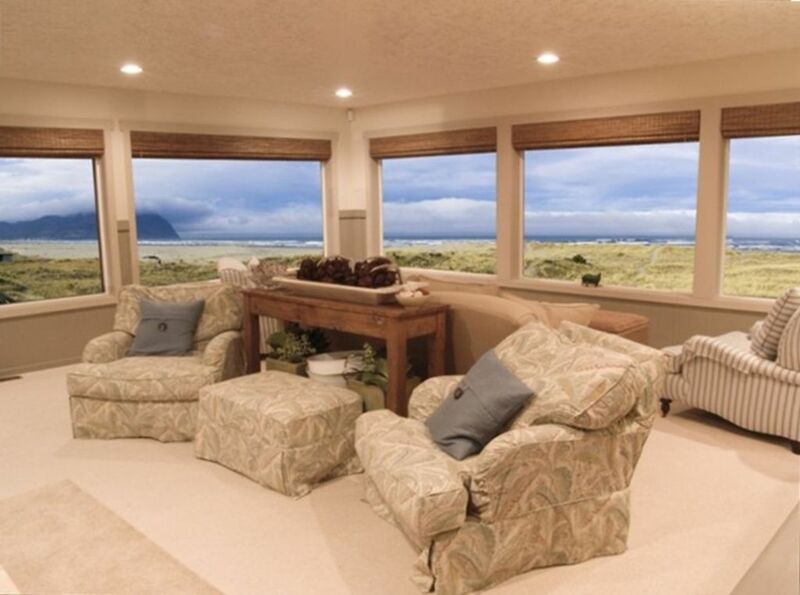 This oceanfront home is one of the best on the Oregon Coast. Steps to the famous Seaside Promenade yet has the privacy one wants. Step directly onto the Oregon Coast from your deck. The 1st. floor has large oceanfront living room, Kitchen and eating Nook, large Family room with Dining area, Oceanfront master bedroom with king bed and private bath, 2nd bedroom has a queen bed, 3rd bedroom has 2 sets of bunks. 2nd full bath off the hall. with lower ceilings. Very comfortable newer beds. Great area for the kids to get away from the parents and make lots of noise. You will enjoy having a BBQ while watching the sunset. This home is furnished with every possible luxury that a person might want while enjoying their vacation on the Oregon Coast. Seaside has everything to offer to keep adults, Teenagers and small children happy and active. Shopping,Hiking,Biking,Fishing,Crabbing,Swimming,Surfing,Boogie boarding, Beach Combing,and much more. Walk to the Outlet Mall, Movie Theater, Down Town, stroll on the Boardwalk, or crab/fish of the 12th Ave bridge. this home is truly Oceanfront and only steps to the Famous Promenade. Micro, coffee maker, Blender, toaster, fully equipped. 32' LCD in Master Bedroom and 48' LCD in Family room. Loved the easy access to the beach and promonade. The upper level was comfortable. Could have had more closet and dresser space for clothes and suitcases. We are happy you enjoyed your stay in our home. Thank you for your suggestion on dresser and storage space, I will look into how we can improve this. The living room & dining room (shared space) of this property is beautiful and comfortable. The kitchen & laundry facilities were adequate. The bedrooms and outside living spaces were sub-par however. Only the Master is normal sized with ocean views (though no window screens)...all 4 other sleeping areas were small, cramped, dark, low ceilings and/or spider havens. Every Guest complained about their sleeping accommodations. The ceilings are so low in the basement that height and head smashes are an issue. The outside decks and ocean viewing areas had NO furniture to speak of (3 wobbly plastic chairs and a cracked chair). There was also an old, wooden picnic table it it did not face the view. The back deck of the house had none. I would NOT return to this property. As always we strive to make sure our guest are happy. I am very sorry that your family where not completely satisfied with our home. Is true and accurate- it also states upfront that the lower level does have lower ceilings. We believe in a true and accurate representation of our home by description and pictures. We do take all concerns to heart. The lower level does have lower ceiling from 6 ft - 7.5 ft. The lower level has 6 ceiling lights and 4 lamps, there are also 2 windows and you do get a peek of the beach grass. Both windows are above grade. Screens on oceanfront homes do not work very well with the salt air or wind. Our home is cleaned by a crew of very dedicated people at least twice a week and always between guest. The exterior deck raps around the side and beach front of the home and has 2 - 6ft picnic table that our guest move around to their wants and needs. I do admit that they are older and are going to be replaced with new, with all the other upgrades we are planning, beginning October 8th. Every year we add upgrade - This year it is a new Gas Fireplace, Hard surface Flooring in the living room, bedrooms and kitchen of the main level, rebuild of the deck and new outdoor picnic tables. We have been renting our home for over 10 years now and am very happy to say the 98% of our guest are very happy with our home and many come back year after year. As always we thank you for your review and will continue to work hard to make sure all of our guest stay a great experience. Location! Location! Location! A perfect spot for our family to come and help celebrate our 50th Wedding Anniversary. The view is amazing and is framed by the beautiful windows. The furniture is comfy and begs you to relax. The kitchen is well stocked with dishes, flatware, pots, pans etc. The large dining/family room easily held 10 hungry adults and Sequence players. Beds were comfortable and bathrooms clean. However, upon our arrival, we found the rest of the unit to be very dirty. In the kitchen, there were bread and cracker crumbs on the counters and floors. Grease on the stove top and back splash and I don't think the oven had been cleaned in quite sometime. The refrigerator was clean in the inside but greasy on the outside. Dusty throughout the house. Sand in chairs and sofas. Floors had not been swept nor the carpets vacuumed. The light colored carpet was showing signs of a long summer of use. I am glad you enjoyed your stay in our home. We strive to be sure our guest want to give us 5 stars; however we do miss the mark on rare occasions. I am sorry that our cleaning crew did not do the job to the standard that we all expect. This team has been cleaning our home for over 10 years so I am surprised but have spoken with them about this. They do send their sincere apologies and will be sure to try harder. We do ask that you strip the beds of sheets and start a load of wash . We do this to insure that all bedding gets washed between guest. We also ask that you load and start the dishwasher. We are very excited for the improvements that will be coming this October and November. We will be posting new pics after completion. Fabulous house right on the beach! Lots of room for 3 families to have their own space plus room to gather together. A rare combination! Comfy furniture with lots of seating for everyone. Thank you for your review, very happy that you enjoyed your stay and look forward to you coming back again. Stayed here with three families (6 adults,5 kids, 2 dogs) and it worked perfectly. A 1/2 block off the prom to the north side that makes walking into town a nice 10 minute walk and far enough away to get peace and quiet. We were here during the Seaside Volleyball tournament and you wouldn't have known unless you walked into town. Easy beach access with a trail right in front. House is clean and well stocked, dishwasher wasn't working but the owner had it fixed while we were there so no inconveniences. Plenty of spaces for kids and families for their own space and lots of room for large gatherings in multiple rooms. Downstairs is very spacious as well, there is one bedroom that is pretty small with no windows that could feel cramped but we didn't need it. Couple of easy improvements could be a gas BBQ instead of charcoal and maybe throw a ping pong table in the spacious garage but overall it was a very good location and house for a large group and multiple familes. We are glad you enjoyed your stay. We agree a gas BBQ would be convenient however being ocean front the salt air makes them non functioning very fast. This is why we place a new coal BBQ every year and it adds the the beach feel. We will look into a ping pong table-good idea. Absolutely loved this house! ❤️ Everything about it was perfect! Had the most amazing five days with our family! Comfy, cozy, spacious and clean!